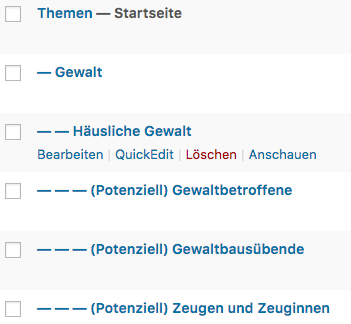 So my question is: How can I replace these dashes with something specific? Do I really have to implement a custom list table or meddle around with jQuery? You can't change dashes using any filter because there is no filter available to change it. And even changing that table is very difficult, because the class instance is set to a global variable with the function _get_list_table(), which doesn't even offer a filter. Welcome to the wonderful world of procedural code. Beware that if you mimick core behaviour in your own functions you become vulnerable to future core releases. The dashes are because you have them listed under parent pages. Lower right side of the page edit screen you can remove the parents if you want or need to. Not the answer you're looking for? Browse other questions tagged pages filters jquery hooks wp-list-table or ask your own question. How do I replace title with my plugin?